As we head into the homestretch of a most unconventional race, a new political force could well decide the outcome: the millennial vote. This election marks the start of a new political era, with millennials (born 1981-1997) now eligible to vote in equal numbers to baby boomers (1946-1954), who have dominated for the past 20 years. In 2016, the millennials and boomers each make up about 31 percent of the electorate. While Generation X (1965-1980) accounts for 25 percent, and voters older than boomers 12 percent. What millennials do with this new power—whether they know they have it or not—could decide the election. And in many ways, the stakes are highest for Hillary Clinton. The millennial vote—and very possibly the election—is hers to win or lose. Traditionally, young adults could be counted on to lean Democrat, and indeed millennials flocked to Barack Obama in large numbers in 2008 and 2012, giving him 67 percent and 60 percent of the young vote respectively in those elections, according to exit polls. That strong support in 2012 proved pivotal for Obama, who won his second term with a narrow four-point victory over Republican Mitt Romney. 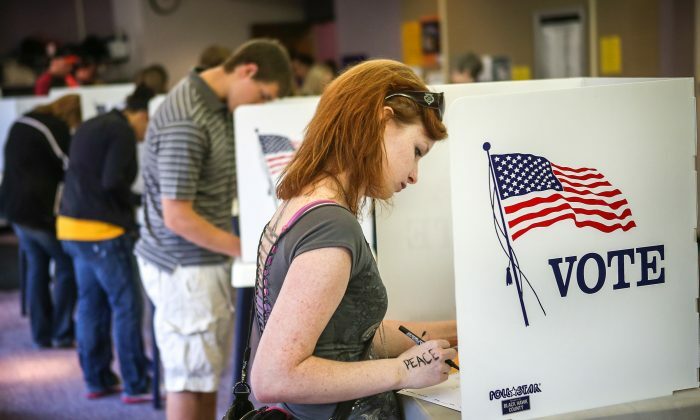 At the time, millennials made up just 19 percent of the electorate. The role millennials played for Obama is worrisome for Clinton, who has not managed to win the affections of Obama’s young supporters. In a recent national poll by Quinnipiac University, only 31 percent of millennial voters supported Clinton in a four-way race. To be sure, Republican nominee Donald Trump has not won them either. He only polled at 26 percent. Instead, third-party candidates picked up the slack, with Libertarian candidate Gary Johnson coming within two points of Clinton at 29 percent and Green Party candidate Jill Stein getting 15 percent. Millennials have told pollsters throughout the campaign that they don’t like either major party candidate. Thus, the biggest threat to Clinton isn’t that millennials will vote for Trump, it’s that they’ll spend their political capital voting for a third party or they won’t show up at all. In an election that’s proving to be a squeaker, and with more millennial votes at stake than ever before, either scenario could prove disastrous for Clinton. A lot of observers are pointing out that to make it, Clinton needs numbers similar to the 60 percent won by Obama in 2012. Right now, the Democratic faithful are doing whatever they can to help millennials awaken to their superpower and save them at the polls. Clinton’s biggest problem is that millennials don’t like her. By contrast, they loved her main rival in the primaries, Sen. Bernie Sanders (I-Vt.). Millennials’ natural left lean was focused almost entirely on him. More millennials voted for Sanders than Trump and Clinton combined—2 million votes compared to 1.6 million. The “Bernie or Bust” loyalty many millennials felt hasn’t left them. Stephen Crociata, a 26-year-old digital media professional from Cortlandt Manor, New York, is a former Sanders supporter who won’t be voting for Clinton. “I was pro-Bernie and anti-Hillary. … It’s important for me not to be hypocritical in my thinking,” Crociata said, explaining why he plans to vote Libertarian. Crociata says he knows his candidate has a slim chance of getting elected. “I don’t believe that Gary Johnson will win unless some miracle happens,” he said. But he wants to make a point. In 2012 Crociata voted for Romney. Winning over Sanders’s young admirers has been a bigger challenge for Clinton than expected. Back in June, Politico ran a story detailing her efforts, which include hiring Sanders youth outreach workers, launching a digital campaign, and deploying Sanders himself as a Clinton surrogate. Given the polling numbers, those plans have not borne the expected fruit. With Clinton’s weakness among millennials continuing in the final stretch, her campaign has recently launched a blitz to try to convince contrary youth that their current predilections could let Trump in. “I need you to work with me,” Clinton wrote in an op-ed titled “Here’s what millennials have taught me,” published on Sept. 19 by Mic, a website that targets millennials. The same day the op-ed was published, Clinton gave a speech at Temple University in Philadelphia urging eligible voters to register. Her campaign recently established Students for Hillary chapters on college campuses in an effort to register 3 million young voters. Also on Sept. 19, Sanders appeared on MSNBC’s “Morning Joe,” trying to dissuade his millennial supporters from voting for a third party. Other top Democrats are also rushing to aid their party’s nominee. Barack and Michelle Obama, Bill Clinton, and progressive Sen. Elizabeth Warren have all headlined rallies for the former secretary of state. On Sept. 26, the morning of the first presidential debate, interim chair of the Democratic National Committee Donna Brazile acknowledged the situation on “Morning Joe:” “Secretary Clinton still has a challenge with millennials. They are very, very vital to her success,” she said. The message to get out and vote is now streaming to millennials on all channels, in hopes of reaching them on their own turf. YouTube launched a campaign on Sept. 21 to mobilize millennials to vote, enlisting the help of many young YouTube celebrities. The theme is a neutral Vote In Real Life (#voteIRL), but the packaging is decidedly liberal. Also aiming for millennials, social media platforms YouTube, Twitter, and Facebook will livestream the debates, and Snapchat has partnered with voter registration app TurboVote to offer a way to register to vote on the Snapchat platform in one minute. Clinton has to overcome two challenges to capture millennial votes: wooing back Sanders supporters to the Democratic fold, and getting youth to vote at all—which is never a given. Voting rates among the youngest demographic, measured as 18- to 24-year-olds by the U.S. Census Bureau, have lagged behind the older generations in every presidential election since 1964. And over time, the level of engagement has declined: from 50.9 percent in 1964 to 38 percent in 2012.
for the Next President,” a study released in July by Harvard’s Institute of Politics found that nearly every data point measured indicates a fractured relationship between the government and millennials. Their polling found that less than a quarter (23 percent) of millennials trust the federal government to do the right thing, and only 18 percent trust that Congress will. Dissonance with the two main candidates isn’t helping that. Clinton’s unfavorable rating when the poll was taken was 60 percent—twice her favorable rating (31 percent). For Trump it was even worse at 74 percent unfavorable and 18 percent favorable. “Young people don’t have a comfortable home in either major party,” said Perotti of Hofstra University. Gonzalez says he’s voting for Johnson, the Libertarian nominee and former New Mexico governor. Gonzalez likes the party’s tax proposals and calls for smaller government. He’s also a fan of Johnson’s running mate Bill Weld, the former governor of Massachusetts. Finally, it works against Clinton that millennials are struggling economically after eight years of a Democratic White House. Millennials entered the workforce in step with the Great Recession and, despite being the most educated generation in history, they are still suffering. The real median wage for millennials has declined or remained stagnant for the last decade in nearly every top industry that employs millennials except health care, according to an analysis of the Census Bureau’s Current Population Survey by economists with Young Invincibles. In an election with so many wildcard elements, it may be too daring to say it comes down to just one. There have been headlines declaring that Latinos, blacks, women, unmarried women, Pennsylvania, and Facebook could each decide the fate of America over the next four years. Nonetheless, it is important that millennials have come of political age, for in the elections to come their power will only grow, and politicians will want to harness it. The cares of millennials will become the cares of the nation. As for this year, millennials may not realize their power just yet, but the democratic camp is trying hard to awaken that understanding. For Clinton, young Americans may be her greatest liability—or her ultimate lifeline.